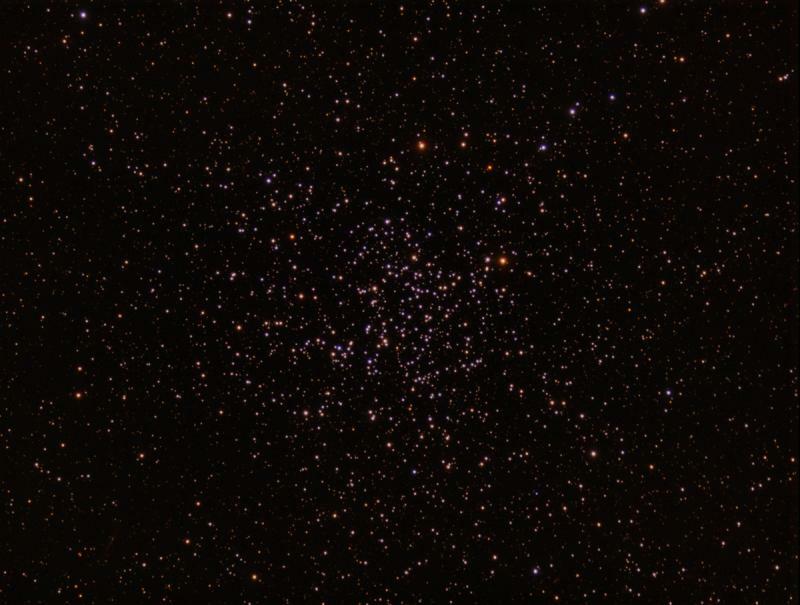 This is a nice southern open cluster, NGC 2477 taken with Sloan i' r' g' filters at f/7 with ASI1600. fwhm's in the stack are about 1.7" with a total of just under 1 hour exposure. 2m x 9 in each filter. No processing or cropping other than levels, gradient removal, and slight color adjustment. Colors calibrated with foreground stars that have APASS sloan magnitudes in UCAC4. You can see faint background galaxies throughout - and since no sharpening or smoothing has been applied the stars are more easily distinguished from smudgy galaxies. You can tell that the brighter stars are blue - but there are additional very bright orange stars. They are red giant branch (RGB) stars. This is a medium age cluster only about 1 billion years old. You can see how the distribution of stars matches isochrones for 1 Gy age. Edited by freestar8n, 12 February 2019 - 04:32 AM.